The baseball and softball games scheduled at Cumberland today have been cancelled. 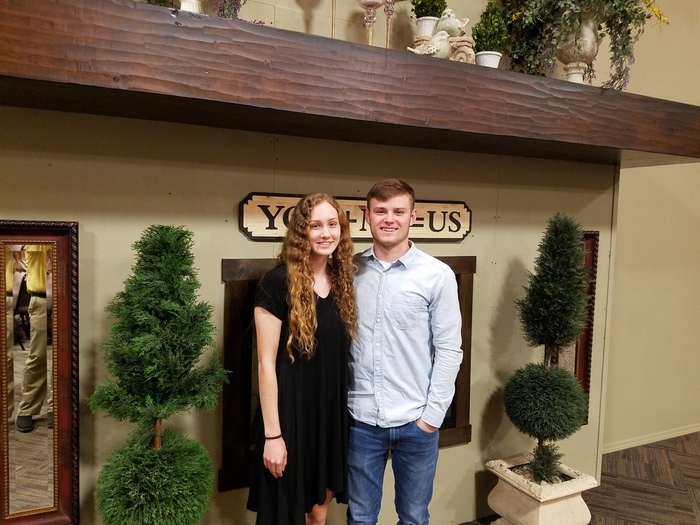 Leah Brown and Connor Butler represented Cumberland High School at the LOVC senior luncheon at Yoders kitchen in Arthur on Wednesday, April 24th. The softball game with Tri-County on Friday, April 26th has been cancelled. 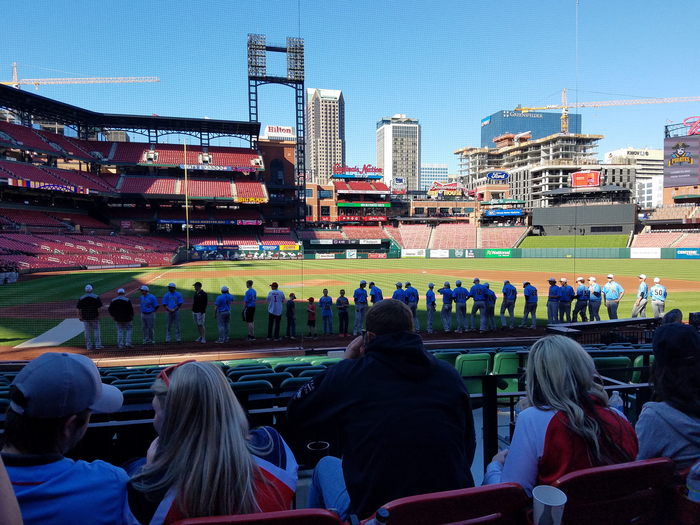 Cumberland Pirate Baseball ready to play at Bush Stadium, St. Louis, MO. Baseball and softball at Cumberland have been cancelled today (4/19). The softball game at Olney next Tuesday April 23rd has been cancelled. The track invitational at Tuscola has been postponed from tomorrow to next Monday April 22nd. The boys team will still attend but the girls will not. The start time will be 4:00 pm. Baseball today (4/18) at Cumberland has been cancelled. Detective Richard Wistocki (Ret.) 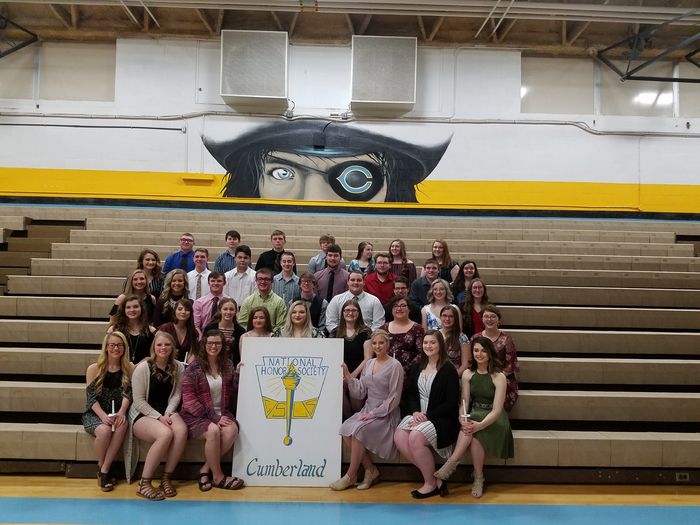 will be at Cumberland High School for a community presentation on Tuesday, April 30, 2019 starting at 7:00. Detective Wistocki is a Nationally recognized High Technology Child Crimes Specialist with 30 years experience in Law Enforcement. Detective Wistocki will be presenting proactive strategies, expert insight and invaluable resources designed to empower your family to combat Cyber-Bullying and Sexting. Detective Wistocki will then be bringing the harsh realities of Internet predators to Cumberland High School and Middle School students on Wednesday, May 1, 2019 at 9:30. In this presentation students will hear actual cases involving teens their age and how these teens fall prey to internet predators. The track meet tonight at Monticello has been cancelled. The baseball and softball games scheduled for today (4/12) will now be played in Palestine at 4:30. The softball game tonight has been cancelled due to Tri-County forfeit. Baseball will still be playing at Kansas. The baseball game vs VGH and softball vs Heritage on Wed. April 24th will now be home games. Both games will be played in Toledo with a start of 4:30pm. Tim Ryan, nationally acclaimed drug addiction speaker, A&E’s “Dope Man", will share his message of drug prevention & the dangers of addiction at CHS on April 15 at 1:30, as well as at a community forum in the evening starting at 6:30 pm. This event is free and open to the public. Today's baseball and softball games have now been moved to Broadlands. Game time will be 4:30. Baseball and softball for today (4/8) at Cumberland have been cancelled. Attention CHOIR Alumni! You are invited to sing a selection with the choir on Fine Arts Night, Tuesday, May 7 at 6 PM. Please email Mrs. Nichols - snichols@cusd77.org - for more information! We look forward to the start of this new tradition! The track meet at T-town tomorrow (3-30-19) has been cancelled. Baseball and Softball scheduled at Cumberland for tomorrow (3-30-19) have been cancelled. Softball today (3/29) at Effingham has been cancelled. Join us for a Cake and Cookies Concert on Saturday, March 30, 2019, at 2 pm at the Toledo Christian Church. 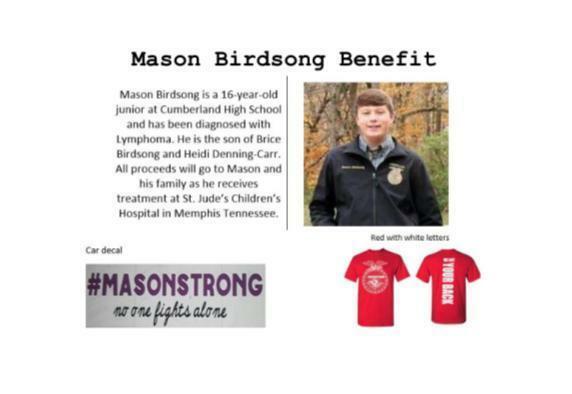 There will be a silent auction on gift baskets. This fundraiser will provide support for our events, equipment needs, and new music! Thank you for your support! HS Baseball for today (3/25) has been cancelled. 8th Grade Boys Sectional Basketball Game - The 8th grade boys sectional basketball game scheduled for tonight at Cumberland will still be played tonight at Cumberland. Cumberland Schools will not be in session tomorrow, Wednesday January 30, due to the extremely low wind chills. All extra curricular activities will also be cancelled. The Middle School Volleyball game scheduled for this afternoon at Cumberland has been CANCELLED. The Fresh/Soph Basketball game and the Scholastic Bowl meet scheduled at Charleston for tonight has been CANCELLED. The FS game at Charleston tonight has been cancelled. Schumacher Orthodontics is happy to announce their "Smiles 4 Schools" donation of $300 to Cumberland PTO. 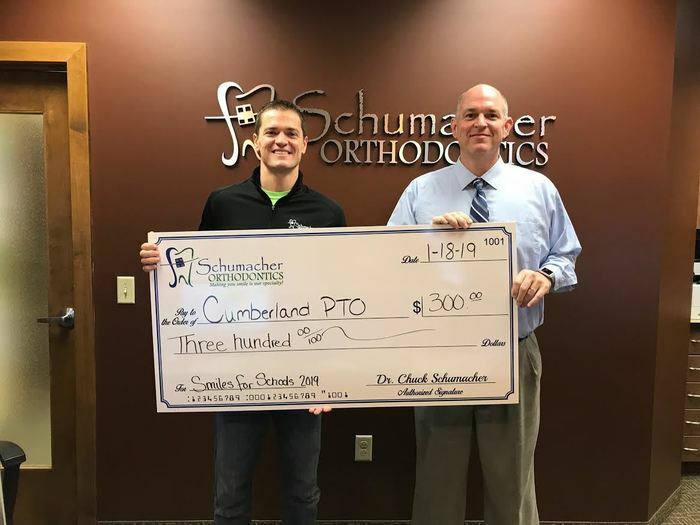 Every time a student from our district makes the decision to start treatment at Schumacher Orthodontics, they donate $50 back to Cumberland Schools. Since 2011, the program has donated over $50,000 to area schools. Thank you for choosing Schumacher Orthodontics! The Cumberland Elementary School is partnering with the American Red Cross to host a blood drive, Tuesday, January 29 from 2:30pm – 6:30pm in the Cafeteria. This drive is coming at a very important time as the Red Cross currently has an EMERGENCY NEED FOR ALL BLOOD TYPES across the nation. Donors are needed now to help ensure blood is available to support patients’ ongoing needs as well as unforeseen trauma situations. Please schedule your blood donation appointment at redcrossblood.org using sponsor code CumberlandES, by downloading the Blood Donor App, or contacting via phone or text……Julie Kerner at (217) 343-0799 or at julie.kerner@redcross.org. However, walk ins are always welcome. Each student that recruits a donor will receive a “thank you” gift from the Red Cross. Every two seconds, someone in the U.S. needs blood. We hope you will join us and help save lives! New Cumberland HS Baseball Coach, Mark Jackley, will conduct a baseball drills camp for grades 5-8 the next 3 Sunday's (January 20, 27, Feb. 3), from 2:30-3:30pm in the HS gym. Coach Jackley would like to share indoor drills that players can do during the winter months for the upcoming season. He will pick out favorite drills that have worked best for players he has coached previously. All campers will perform the drills! January 20-Throwing Drills January 27-Hitting Drills February 3-Fielding Drills The cost of the camp is $30, which will go towards the renovation of our new field. Cash or check payable to Cumberland Baseball will be collected the first day of camp. No registration is needed! Players just need to show up at Cumberland High School 10 minutes before start time on Sunday with necessary baseball equipment for each drill. Parents are invited to stay and watch the hour drill sessions. Please park and enter the gym on the southeast corner of Cumberland High School. Due to incoming weather for January 11th and 12th the following events at Cumberland High School have been changed: Friday, January 11th JV/V Basketball vs. Neoga will have a start time of 5:00 for the JV game and varsity to follow around 6:30. The high school girls’ basketball game @ Okaw Valley has been cancelled for tonight. The baseball team will be selling old game jerseys on Friday, 12/14, in the gym. Coach Jackley will be in the gym all day if you want to purchase a grey or black jersey. The price of a jersey is $20. It will be first come, first served on particular sizes or numbers. The freshman pasta fundraiser is in. It will be available for pick up tomorrow during Flex and after school. Today (October 17, 2018) Cumberland High School staff and students participated in an active shooter drill. Unfortunately in today's world these drills are necessary. We appreciate the staff and students cooperation during this and all other safety drills. Today, October 17, 2018, Cumberland High School staff and students participated in an active shooter drill. Unfortunately in today's world these drills are necessary. We appreciate the cooperation of the staff and students during this and all other safety drills. Pirate football fans: this Friday's game at Arthur is their annual Pink Out Game. All Pirate fans are encouraged to join ALAH fans in wearing pink to the game to help support breast cancer awareness. 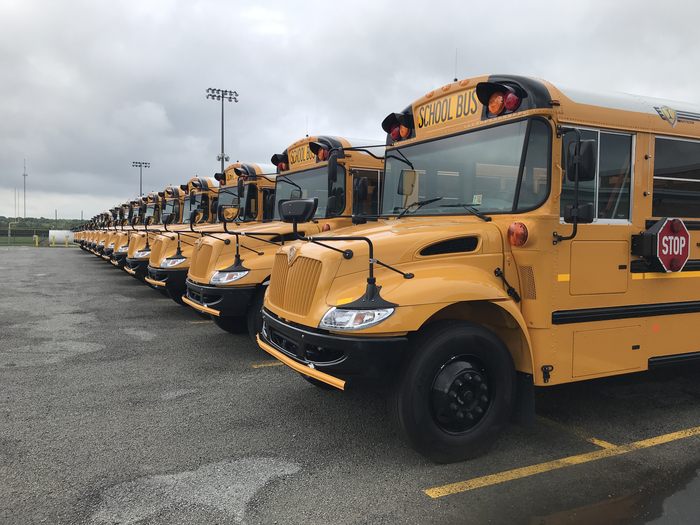 Today at 1:00 pm, after student dismissal, there will be a County Disaster EXERCISE conducted at Cumberland High School . During the EXERCISE traffic flow on Route 121 and on campus will be disrupted and we ask you to please avoid the area from 1:00 pm to 2:30 pm. Thank you. 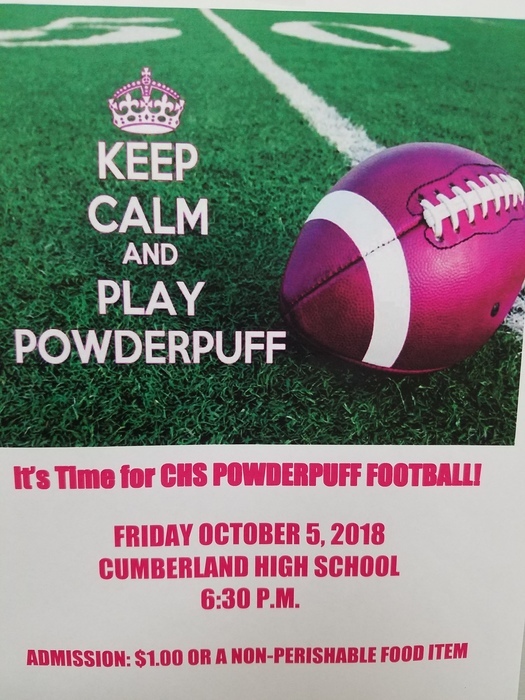 Due to scheduling conflicts the Powder Puff football game for Homecoming will be played on Friday, October 5 at 6:30 pm. The field will be open for teams to practice on Sunday, September 30th from 5:00 pm - 6:30 pm. Today, 08/31/2018, Cumberland Elementary and Middle School conducted a crisis/intruder drill. 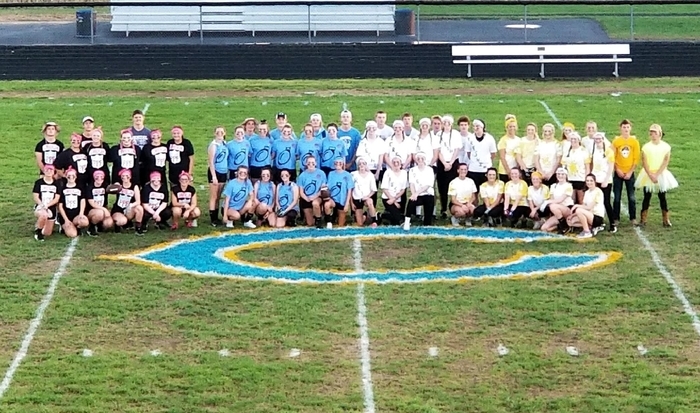 Students and Staff did an excellent job. We are ready to roll out this morning! 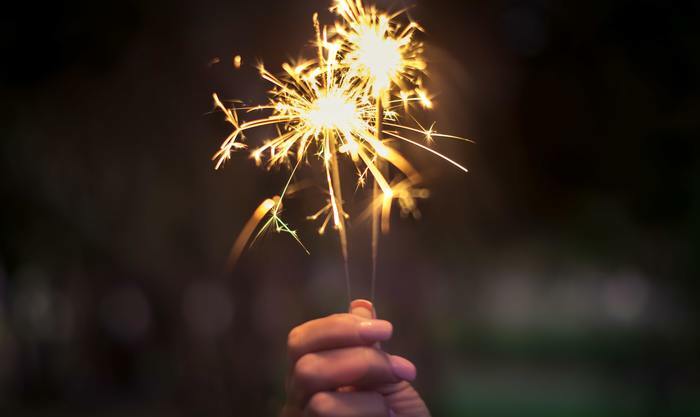 Are you excited to start the new school year? Let’s all have a great first day. Grade school yearbook orders from last spring are ready for pick up on Thursday, August 16, from 6-8 PM. Look for a table in the GS cafeteria to claim yours. If you have decided you want one, there are a few left for purchase. They are $20 each. Due to the tuckpointing project around the front doors of the high school, the front main doors will not be open on Thursday. Staff will need to use the back doors on institute day. Hopefully this project will be done at the end of the day on Thursday. Band Camp for this evening, Wednesday August 8, has been cancelled. Band Camp will resume at regular time on Thursday August 9. The Catholic Charities food bank will be at the Greenup Municipal Building today from 3 to 4:30 for families needing assistance. Registration today in the High School cafeteria from 3-6 pm if you haven’t already registered online.